How is this changing climate? If it is true that is. I live in South Central Ky. We see Chemtrails almost daily when and if the sky is clear. I retired a year ago. Ever since then our weather has been terrible. I can almost know the 10 day forecast by heart. It will be cloudy or partly cloudy with wind for 2 maybe 3 days. Then it will rain for 2-3 days with wind. I have not seen any blue in the sky for 6 days now. Under my deck it has not been dry SINCE I RETIRED! It is just unreal. When you do get blue skies guess what? CHEMTRAILS! Then it starts all over. I am 65 and have never seen such bad weather. I would rather have a dry cold (long as its not below zero) than what we have. I thought it was just exhaust from Jets. Its not? The official claim is that aerial spraying increases luminosity (makes atmosphere more reflective), thus lowering earth's temperature to counteract global warming. The truth, though, is nobody knows exactly what's going on. Outside of government circles, that is. The chemtrail patterns reveal standing waves and electromagnetic effects due to various high powered radio and microwave activity. This type of activity is believed to cause weather changes via heating of various layers of the atmosphere. Which in turn affects storm systems, air flows, etc. The Pentagon said it planned on "Owning the Weather" by 2020, I think it was. 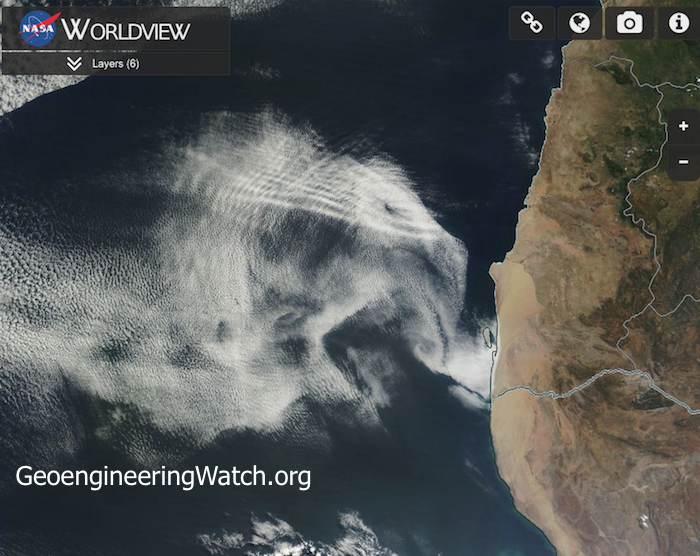 China has several times done large scale weather modification, reported in mainstream news. I once read a blog by a tv meteorologist who said being a weatherman was almost impossible because weather is no longer natural. Well, it IS exhaust, but its not normal exhaust. I was a sky watcher as a kid. NEVER saw chemtrails until the late 80s-early 90s. Saw lots of contrails, though. THESE are not contrails. I've seen a clear blue sky, and a single chemtrail turn that sky into a total overcast mess over the course of an 8 hour period. I literally watched it throughout the day, checking every ten-twenty minutes or so. That is not natural. Nor is it contrail action. If you haven't yet, you really should check the photos in the article. The photos won't solve the enigma, but they DO prove that chemtrails exist and that something is being done in combination with them. And keep in mind, we were all told chemtrails don't exist and it's all just crazy tin foil hat silliness. Which convinces me the official ones saying it's all nonexistent are intentionally lying to coverup something. And the masses who repeat the party line are just completely ignorant of reality. Looks like clouds to me did you get that site from info wars? What about Sandy Hook? Just type in chemtrails and you will see thousands of articles or videos. I have been thinking about calling the Sheriff and asking him to investigate the chemtrails in our county. Surely when they see this happening constantly, they get curious. I fear tho that they were briefed on it long ago, never a word is said. Sandy Hook? Really? What does that have to do with chemtrails, geoengineering, or weather modification?